Allergic rhinitis or hay fever is a condition similar in nature to cold, with symptoms being very much similar in both cases. But the only difference being that a common cold is caused by a viral infection whereas an allergic rhinitis is caused by what you call an allergen. An allergen is actually a harmless substance that leads to the development of an allergic reaction, in certain people who are susceptible to it. In allergic rhinitis, the development of symptoms is in response to specific allergens the most common one being pollen. Other allergens include dust mites, flecks of skin and saliva of animals, as well as the fur and feather of animals. It is a very common condition that most adults experience. It has been estimated that nearly 30 percent of the adult population may be affected with the condition. And research has shown that nearly 8 percent of adults in the United States do experience an allergic rhinitis of some kind. Around the world, most adults experience these symptoms with seasonal change. One of the most features that distinguish allergic rhinitis from a common cold is the fact that you will not experience fever during an episode of allergic rhinitis, whereas in a common cold fever is a common feature. Allergic panel test/allergic skin prick test – where small amounts of the possible materials which you can be allergic to are pricked into the skin of your arm or upper back. After this you wait and watch for the development of a hive/small red bump at the site of the injection, which shows that you are indeed allergic to that material. There are specialists who have been trained to carry out these panel tests. The allergy blood test – where a sample of your blood is sent to the lab to measure the levels antibodies, which are the substances responsible for the developments of the allergic reaction, in your blood. Antihistamines – which are the most commonly used medication in the treatment of allergies. They prevent the production of a substance called histamine released by your immune system, which is responsible for the itchiness, sneezing and runny nose. Therefore by blocking the production it helps alleviate these symptoms. They come in the form of pills, and some of the more popular over the counter antihistamines are fexofenadine, loratadine and cetirizine. Eye drops and nasal corticosteroids – which are nasal sprays and eye drops that help to reduce the inflammation of the nasal lining and help reduce the sneezing, itchiness and the runny nose, as well as the symptoms of watery eyes and itchiness. For most people these nasal sprays are what helps reduce symptoms most effectively. These sprays are also safe in long term use and are not known to cause any complications. Examples include: fluticasone propionate, triamcinolone, mometasone and budesonide. 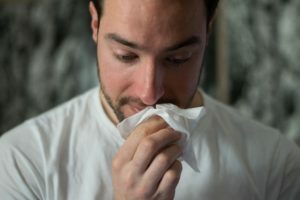 Home remedies for allergic rhinitis include, prevention of exposure to the allergens themselves, such as avoiding opening your windows during seasonal change and using an air conditioner instead. You can try and use a filter designed for pollen. For indoor allergens the use of a dehumidifier might help.